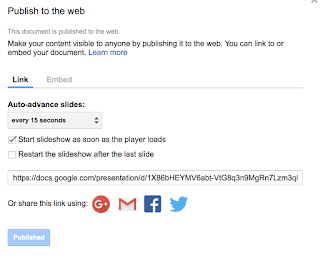 A few weeks ago Google made some terrific upgrades to including videos in Google Slides. 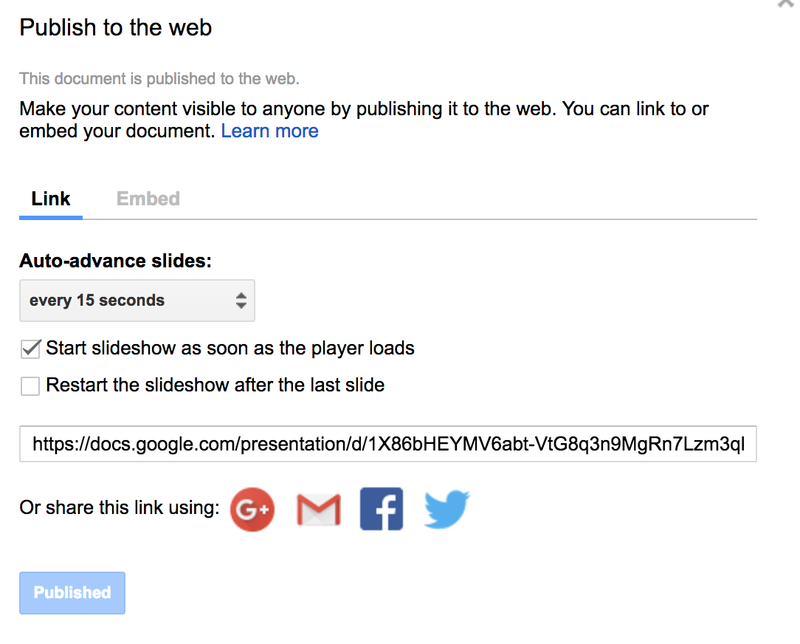 Gone are the days that you can only include videos from YouTube....now you can load in videos from your Google Drive. Hooray! Along with this came some new video options. Once you click the video, a "Video Options" button appears on the toolbar. Clicking this button allows sidebar to appear. On this sidebar you can select a start and stop time for a video (this is great for video you have but only want to show parts of). 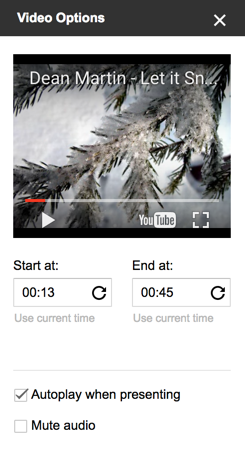 You can have videos auto start when the slide is presented. Finally, you can have video play with muted sound (great to create effect - think introducing Omaha Beach with the scene from Saving Private Ryan playing behind you). All these changes made me think of one of the biggest things I miss from Powerpoint - ability to have music play in the background of a slide show. I began to wonder if these changes could facilitate it, so I began to tinker. I opened a slide deck my children had created thanks to Eric Curt's Make snowmen on Google Slides activity. to INSERT --> VIDEO and searching it on YouTube. Once it was inserted, I shrunk the size of the video screen as small as it could go. This way it would be on the slide, but not visible. I copied the video on every slide. This is where I had to tinker. I wanted to change the start and end times so each slide would have a section of the song. First I tried 10 seconds per slide. (Slide 1 went 0:00-0:10, Slide 2 went 0:11-0:20, etc). I found, once published (see next step) it was too choppy, so I changed it to 15 seconds per slides (Slide 1 went 0:00-0:15, Slide 2 went 0:16-0:30, etc). Still this was choppy so I decided to overlap times. My final "success" was: Slide 1- 0:00-0:16, Slide 2 - 0:14-0:32, etc). I then went published it to the web (FILE --> PUBLISH TO WEB), choosing "Auto-Advance Slides every 15 seconds" and "start slides as soon as the player loads" options from the pop up menu that appears (see to the right). As you can see, in the end, there was a slight pause as slides changed (which is kind of annoying) but it seems to be the best that I can do right now. Anyone have another (better) work around?